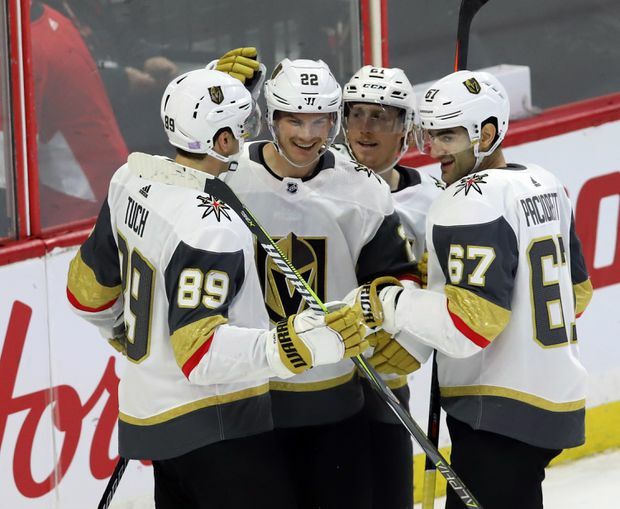 Pierre-Edouard Bellemare had a goal an assist to help the Vegas Golden Knights withstand a third-period comeback to beat the Ottawa Senators 5-3 on Thursday night. Jonathan Marchessault, Shea Theodore and Nick Holden helped the Golden Knights (7-8-1) build a 3-0 lead before Ottawa mounted a comeback. William Carrier had the eventual winner 9:16 into the third, with Bellemare earning an assist on the play, as Marc-Andre Fleury stopped 25 shots. Vegas Golden Knights defenceman Nick Holden celebrates his goal against the Ottawa Senators with teammates during second period NHL hockey action in Ottawa on Nov. 8, 2018. Matt Duchene, Ryan Dzingel and Thomas Chabot each had a goal as the Senators (6-7-3) tied it 3-3, while Craig Anderson had a busy night making 37 saves. Thursday’s game featured the return of Senators rookie Brady Tkachuk, who had missed the last nine games with a torn ligament in his left leg. Trailing 3-1 to start the third, Ottawa tied the game scoring twice in a span of 64 seconds. Dzingel made it 3-2 and right after Chabot had a wide-open net as Fleury was caught sprawling. Vegas regained the lead midway through the period as Carrier won a battle along the boards, stepped around Mark Borowiecki and beat Anderson stick side. The Knights made it 5-3 as Bellemare had a wide-open net after Anderson got tangled with Carrier. The Senators challenged for goaltender interference, but the call on the ice stood bringing the crowd of 15,213 at Canadian Tire Centre to boo in unison. Vegas dominated much of the second period and took a 3-0 lead late in the period as Holden jumped into the play and lifted the puck over Anderson’s right shoulder. It was his first with Vegas. Ottawa finally solved Fleury at the 17-minute mark. Fleury poke checked Chabot, but the puck went right to Duchene. Mark Stone picked up an assist on the goal, extending his point streak (two goals, nine assists) to five games. The Knights jumped out to a 2-0 first lead scoring twice on the power play. Marchessault opened the scoring at the 15-minute mark and with 20 seconds remaining in the period Theodore, from just inside the blueline, fired a puck through traffic. With the win Vegas swept the season series 2-0. Notes: Ottawa LW Max McCormick was a healthy scratch. Vegas was without LW Erik Haula as he was injured Tuesday against Toronto.